If you don't have any home Wi-Fi, like to watch videos on public transportation, or just always find yourself streaming Netflix when there are no hotspots available, your cellular data is probably gobbled up fairly fast. For limited data plans, watching the next episode of your favorite TV show could mean overage charges on your cellular bill, but it doesn't have to. 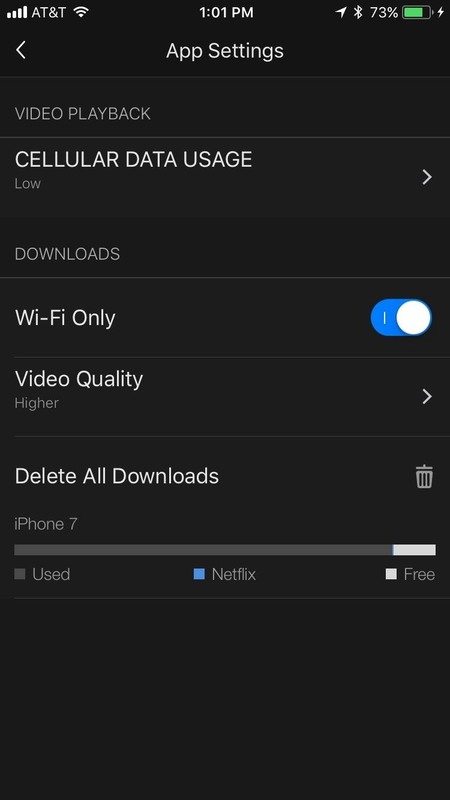 To keep data use down when streaming TV shows and movies in Netflix on your iPhone or Android device, there are a few options, depending on how you want to go about it. 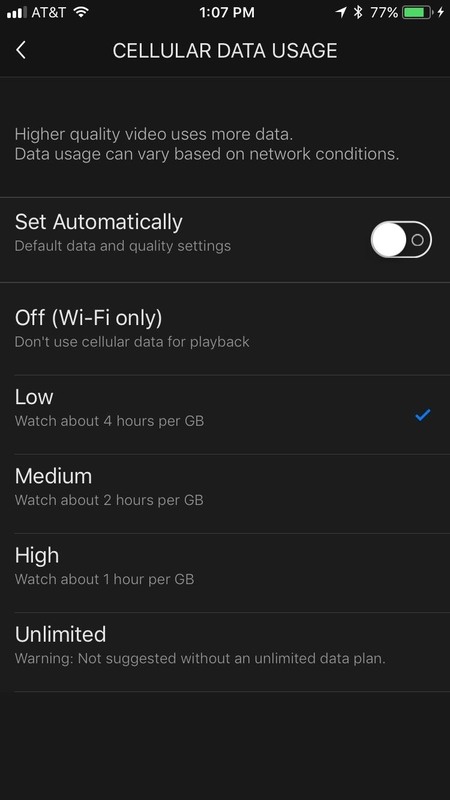 If you only want to limit how much data the Netflix app uses on your phone, this first method is all you'll need. However, if you'd like to limit data usage for all devices that access your Netflix account, skip down to the second method. As mentioned above, use this first method if you're only trying to save data on the phone you're using right now and not any other phones or tablets connected to your cellular usage — or to your Netflix account period. Tap on the hamburger icon in the top-left corner of the main screen. Scroll to the bottom of the page, then tap "App Settings." Tap "Cellular Data Usage." From here, you will find six options to choose from. If you choose "Set Automatically," all other options will be grayed out. This is not a good choice for anyone looking to control how much data their streaming uses, so we'd recommend disabling this option. From there, if you never want Netflix to stream unless connected to Wi-Fi, the "Off (Wi-Fi only)" option is for you. Otherwise, to minimize data usage, go with "Low." It uses up the least amount of data — 1 GB for every four hours of streaming — and while your quality may suffer, your data bill will not. If your data plan has some more wiggle-room, feel free to choose one of the higher-quality options. Just be mindful that your GB-to-hour ratio will jump significantly with each quality bump you choose. The above method will only affect the device you are currently using. If you have multiple devices connected to the same cellular plan, you'll either want to do Method 1 for all of them individually or limit data usage for every device that connected to Netflix. This will also affect your TV at home, so keep that in mind. Tap the hamburger icon on the main screen. Scroll down, then tap "Account." The app will then launch Netflix in your web browser. Once on the page, scroll down and find My Profile. 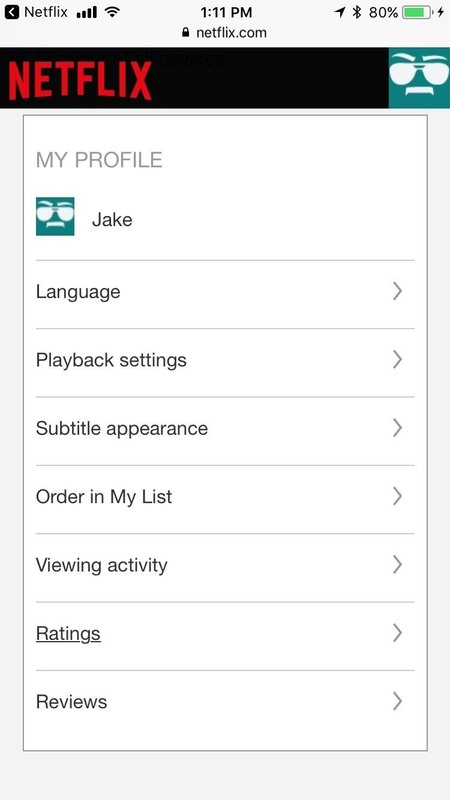 From here, tap "Playback settings." Again, "Auto" is not for users looking for control over their data. Analyze the different options here, and choose the one that's right for your devices. 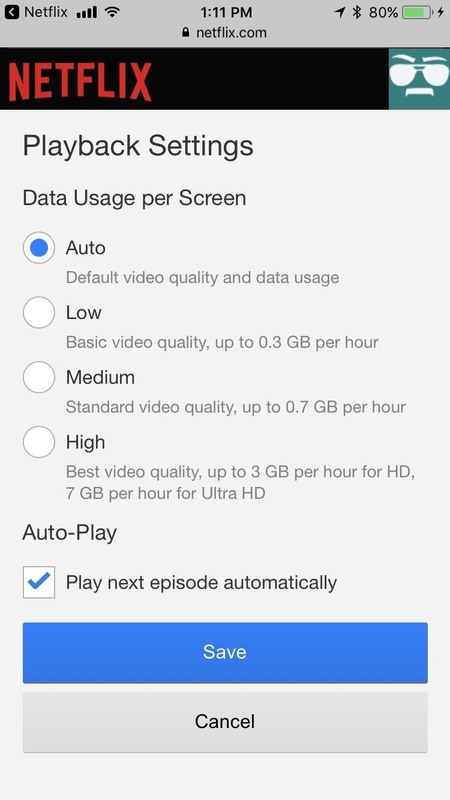 Netflix "conveniently" flips the way it represents data usage here versus in the app settings, but the basic idea stays the same. If you want to use as little data as possible, go with "Low" for sure.